The Irish guitar player, Rory Gallagher, takes up an unusual place. He doesn't care about all the trends and adventitious circumstances, and yet since his entrance in the music business, he fully goes his own way. His jeans, chequered shirt and completely paintless guitar have become almost legendary by now, as well as the pace with which he travels all over the place. Almost ten years ago, I was part of a Dutch blues band, which people at a certain point thought it was high time for honouring, the, by that time, practically impregnable England with a visit for musical sake. On that occasion, the band was confronted with a sort of a musical tutor in the person of Alexis Korner, who is said to be the father of the British blues, and who afterwards also gave the band a good deal of fatherly advice. Under his inspiring guidance, my band at the time and I went to frequent the famous musical temples of the English capital. Very soon we came into contact with two bands who at that time seemed to be very promising and who later turned out to be so indeed. The first band was “Free”, of which a number of members as part of “Bad Company” still reap laurels today. Alexis was a strong admirer of this band and he didn't make a secret of it. The other band which was called “Taste” didn't find that much favour in his eyes, he was of opinion that they didn't play “real” blues. This put me in a fairly awkward position; I didn't dare to admit that their approach of the blues, which was a lot looser, especially concerning the rhythm section, appealed to me more. But it was the guitar player in particular who awoke my attention. That guitar player was called Rory Gallagher and I would actually like to know what Alexis Korner thinks of him. Rory Gallagher is the kind of guitarist, that to me, is brought out better live than on vinyl although his accomplishments thereupon certainly aren't bad, of course. After a number of successful years, the band “Taste” was being dissolved and Rory continued under his own name. He found an also Irish rhythm section prepared to act as his accompaniment and he added a pianist to the company of players later on. By this time, apart from the original drummer, the formation still plays with the same group of people. A number of LP's have been released, but Rory and his companions owe most of their reputation to the many live performances they gave. When it comes to The Netherlands, the last few years Rory has been around a bit less than before, but that is going to change. According to plan, he will visit several Dutch cities. So lovers of Rory’s usual guitar work can indulge themselves one more time. It is a sympathetic quality of Rory that he regards being a musician purely as his profession. He doesn't stand on a pedestal, which clearly influences the communication in a positive sense. To promote his upcoming activities in our country he has already been already here for a day of so to explore the terrain. Characteristic of the fact that Rory never bothered following current trends is his use of the Vox AC 30 suitcase amplifier in a time when practically every guitarist passed to the famous Marshall tower. Does he still use that amplifier? The addition of that five position regulator is a very good one. It so happens that with the Stratocaster a very beautiful sound can be achieved by turning on the rear and the mid part at the same time. On a standard Stratocaster, that can only be done by placing the switch exactly in the middle of the two positions. Many guitar players I know discovered this option very quickly, but unfortunately the switch never remained in the right position. Every time it would fall back to the rear or the mid position. At first, Rory solved this by deliberately dirtying up the switch, because all that dust made the switching considerably stiffer. That the Fender company never provided for this is somewhat remarkable. In fact, a lot of guitarists change that tone adapter, but according to Rory that is going to change and as of the beginning of this year the Stratocasters will be provided with a five position switch. So when it comes to the point, Rory and his good old Strat are inseparable. This doesn't mean that he doesn't keep any other instruments. Like he said just now, he is loafing around quite a bit with other guitars. But that's all there is to it. What else does he have? The use of the right strings is something that occupies the mind of every guitarist. Everyone has his own preferences for that matter, while the choice of strings is clearly relevant to the music that is played. 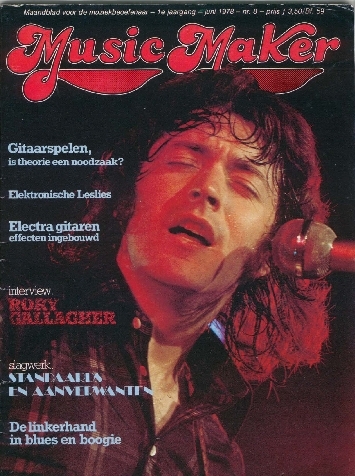 Rory Gallagher: “When I play “Cradle of Rock”, for instance, I don't know if you are familiar with that one, or “Jacknife Beat” I use the Stratocaster with the regular tuning and Fender Rock’n Roll light gauge strings. Playing something like “Bullfrog Blues” I use the Telecaster on which the strings will have the following thicknesses: 013, 015, 020 etc. In any case, thicker strings which produce a richer sound. If I could, I would like to use even thicker strings, but sometimes I tune the guitar in A or E and I use a capo for playing higher tunings. On the acoustical guitar, I take the tuning down to D or G. In that case, I use medium bronze earthwood strings. I always use rough wound strings, and also for playing slide. I know that Lowell George of Little Feat combines ground bass strings with other high strings”. The Gibson Les Paul hasn't crossed Rory’s path up until now. Looking slightly caught, he says that now he would kind of like to have one and that in this case he would prefer the older type with the white elements only. This type is being produced again, although he is of opinion that the electrical part should be at least as good as it used to be. Also he appears not to be insensitive to the current critical attitude towards the wood that is used. As opposed to the Stratocaster, the famous Gallagher Vox Ac 30 has somewhat faded into the background. The fact that he has used an amplifier like that for so long, indicates that his views on the use of amplifiers are very personal at least. What does he use nowadays? “Lately I have been using a Fender Concert Amp a lot. It is also a slightly older model and has four 10” speakers. Sometimes I connect that amplifier with an, again old, Fender Bassman that also has four 10” speakers. I use these amplifiers either together or separate from each other. It depends on the circumstances. Recently I bought an Ampeg VT 40 and also that one has, it's becoming a drag, four 10” speakers. It is possible that I'm going to use that one for a while. It has a good mid-range and the amplifier can be distorted really well when you crank up the volume. That's about it; I'm still experimenting a bit. Does he feel that a glut of those effect pedals stands in the way of the actual playing? As is it's the case with many, Rory initially went by the appearance of the guitar. Instead of by the sound of the instrument, he was charmed by it watching all sorts of cowboy movies. The cowboys of those days were tough guys always impeccably dressed, who all seemed to play the guitar somehow. So colourful heroes with names like Roy Rogers and Gene Autrey (Rory must have been watching this type of movies when he was still very young, although it can't be ruled out that they weren't broadcast in Ireland until then) provided the basis. Wonders will never cease. The next step when people like Elvis Presley, and the especially for English musicians important, Lonnie Donegan, began to happen in Ireland, consisted of constructing a guitar on his own. There are many different opinions on how somebody begins playing the guitar should go about it. Much depends of course on the musical preferences, but a big obstacle for many is created by the question to what extent a theoretical foundation can be important. This again depends completely on what the personal intentions are, but it is a fact that still many beginners have problems getting started on the theory. Rory isn't bothered in any way by a glut of technical knowledge. What is his opinion hereon? At the Frankfurter Messe, a guitar which was called the Aria Pro 11 caught my eye. Rory saw this guitar once as well and expects a lot of it, although you can't speak of a copy in that case. “There are many good guitars, even Steve Miller plays on an Ibanez. The old Höfners were good, just like the Burns guitars. But even if you don't have such a good guitar, there are many ways to improve your guitar. The use of the right strings for example or the lowering of the bridge. There is another trick that can be pulled with a guitar with a detached neck. Suppose the neck were straight, but the guitar doesn't play well. Then if you detach the neck, you should put a real thin piece of paper or wood in the space where the neck goes. This makes the neck lean over backwards so to say, which is a better solution than frenetically bringing down the bridge. Gibsons have always had a slightly tilting neck. On the new Fenders on the plate where the screws are that fix the neck, a little screw to adjust the neck. After that of the Gibsons, now also the alleged difference in quality between old and new Fenders has been brought up. Rory can't say much on the matter, but he does say that he noticed that the finishing is sloppier which particularly shows in not well attached screws, sloppy solder etc. Towards the end of the conversation we get to the strings again. Rory is just like many other guitarists of the opinion that you should by no means take too thin strings. As he has said before, he mainly uses Fender Rock ‘n Roll light gauge which are slightly thicker than the slinky strings. Other good strings are according to him Bicato and for the acoustic work a rather unknown brand that is called Schubert (probably from Germany). He has to change strings quite a lot out of necessity. Because of the high amount of salt in his blood his hands perspire reasonably during performances. This explains therefore immediately the paintless condition of his guitar. While leaving Rory asks if I have enough information and apologizes, entirely wrongly, by saying again that he is after all a fanatic when it comes to instruments and related equipment. Well, he has my blessing. 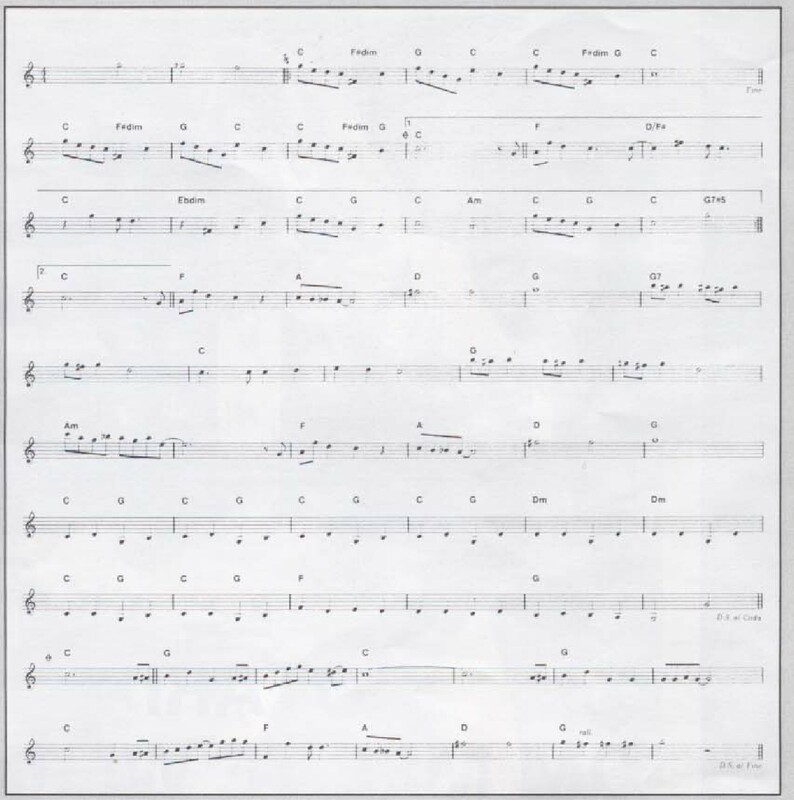 Printed here adjoining is a piece of “Unmilitary Two-Step” that Rory recorded with the use of his Martin D-35 on his album “Blueprint” in 1973. The song is based on Rev. Gary Davis’ style although Gallagher plays with plectrum and fingers. According to Rory 90% of his songs are improvised and 10% is worked out beforehand.